Kevin Darby with wife Kristina and daughters Kylie, Baylee and Bella.Seeing the big green and gold ambulance in downtown Florence, Alabama, brought back memories for Kristina Darby. It is not just an ambulance — it is a mobile intensive care unit, part of the Critical Care Transport program of UAB Medicine — used to transport the sickest of the sick from one medical facility to another. 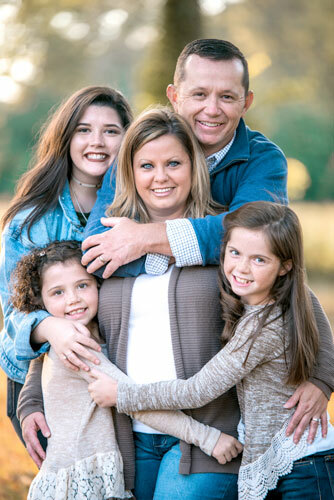 Some three months before Kristina passed it on the street that afternoon in May, it had played a major role in saving the life of her husband, Kevin, from a little-known and oft-ignored killer: sepsis. 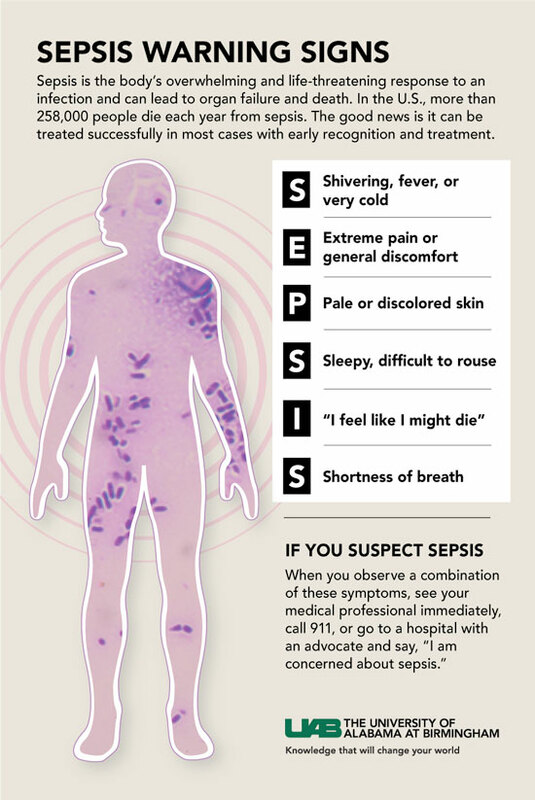 Sepsis does not get much attention; but it is a medical emergency, a life-threatening condition caused by an overwhelming response by the body to infection — so overwhelming that it begins to cause injury to the body’s own tissues and organs. Forty percent of patients diagnosed with severe sepsis die, and half of the survivors suffer from a debilitating condition known as post-sepsis syndrome. Sepsis has also been named the most expensive in-patient cost in American hospitals, according to a study published by the Agency of Healthcare Research Policy. Costs to hospitals in 2014 reached nearly $24 billion. For Kristina Darby, the sight of that big ambulance driving down a street in her hometown reminded her of how close she came to losing her husband and the father of their three children to a condition of which most Americans are barely aware. Kevin Darby did not get sick much. 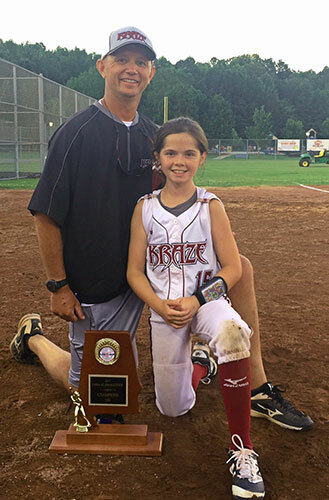 He was a firefighter, owned a lawn maintenance company and traveled extensively as a coach for his daughters’ softball travel team. He was the picture of a healthy man in the prime of life, until he got sepsis. On Saturday, Feb. 4, 2017, Darby and two other men on his firetruck came down with the flu. With a typical firefighter’s work ethic, Darby finished his shift even as his flu symptoms worsened. On Monday, he went to a local health care facility, was given Tamiflu and was sent home. By Wednesday, his wife called 9-1-1, and paramedics took him to a nearby hospital. According to the Sepsis Alliance, septic shock follows severe sepsis and results in organ failure. Blood pressure drops to dangerously low levels. This is a life-threatening condition, a medical emergency. Physicians at the hospital told Kristina that Kevin needed advanced treatment, and they wanted to send him to UAB. The CCT mobile intensive care unit made the 236-mile round trip overnight on Feb. 9. Darby’s blood pressure had dropped to 70 over 40. He was going into multi-organ failure and had acute respiratory distress syndrome, or ARDS. He was a very sick man. But Darby was not out of the woods. He spent 29 days at UAB, most of it in intensive care. There is no easy fix for sepsis. In Darby’s case, the team had to treat the underlying flu, but also move quickly to resolve the sepsis symptoms. He was on a ventilator, and received multiple antibiotics and IV fluids. He was placed on a roto-prone bed, which flips the patient over to take pressure off the back of the lungs so they can oxygenate better. And there’s the rub. Sepsis is not well-known in the general population, and most people do not know the signs and symptoms. Overworked emergency rooms and outpatient clinics often send patients home before the symptoms are obvious. O’Reilly and Acosta-Lara say that education and awareness are the keys to reducing the death rate associated with sepsis. A drop in blood pressure is a warning for sepsis. So are drowsiness, fatigue and confusion. People who have recently been hospitalized are at greater risk, as are those with overall increased risk for infection such as the very young or very old and those with chronic diseases or a compromised immune system. And it is not just a bad case of the flu that can lead to sepsis. According to the Sepsis Alliance, any infection, from a bug bite or hangnail to a severe disease such as pneumonia or meningitis, can trigger sepsis. The infection can be bacterial, viral, fungal or parasitic. Darby was able to resume coaching his daughter's softball travel team this summer.Hospitals are by and large paying attention. UAB has created a sepsis campaign to stimulate increased awareness in nursing units and outpatient clinics. A logarithm called Q-SOFA can be employed to gauge the severity of symptoms, and whether they worsen. It has been 10 months since Darby came down with sepsis (the other two guys on the firetruck just had mild cases of the flu), and he is recovering; but he admits that he is not yet back to full health. He was able to coach softball again by early summer, but he has not been cleared to resume firefighting duties. He dealt with post-sepsis issues such as nausea and lack of appetite until early fall, losing more than 40 pounds. Darby is hoping for clearance to resume his work with the fire department in the beginning of 2018. In the meantime, he will continue to recover. And this fireman, business owner, coach, husband and father has added one more title to his resume: advocate for sepsis awareness. For more information on sepsis awareness and prevention, visit the Sepsis Alliance webpage at www.sepsis.org.